Microsoft today announced that in Windows Phone 8, they will offer NFC support and what they are calling “the most complete wallet experience”. Using Fast Cards, you can access credit & debit cards, loyalty & membership cards, access saved deals and support for NFC ‘Tap to Pay’. 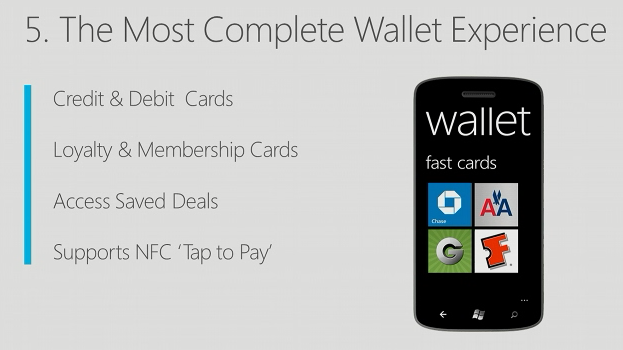 Every Windows Phone 8 device that ships will include the wallet hub, integrating third party apps and services. The are working with wireless carriers to provide secure SIMS. In the US, AT&T, T-Mobile and Verizon work with ISIS. Microsoft working with ISIS, hoping to have a solution sometime in 2013.